We, Tim Jenkinson and I, began at the car park near Whiteworks, heading south through Nun's Cross Farm. 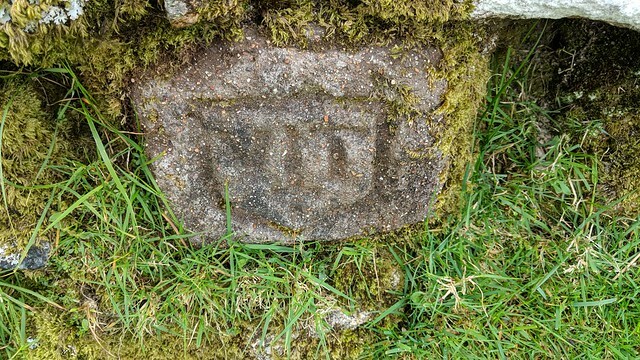 Within the boundary walls is an odd stone with an engraved crest, that is something of a mystery and one that is yet to be solved! Between the letter "J and T" there is a sword. 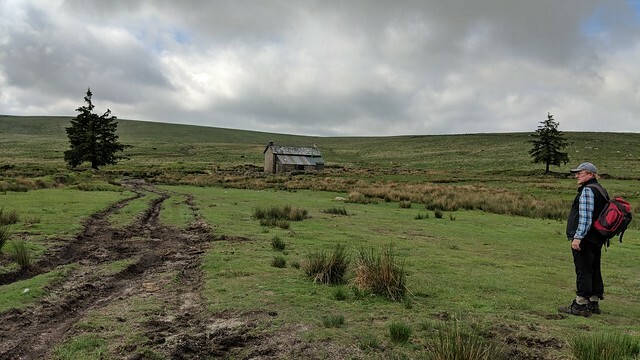 The initials don't fit with anyone known to reside at the property but Legendary Dartmoor has more on this mystery, on his website here. The going from the farm was pretty good, much better than previous excursions up to Great Gnat 's Head. 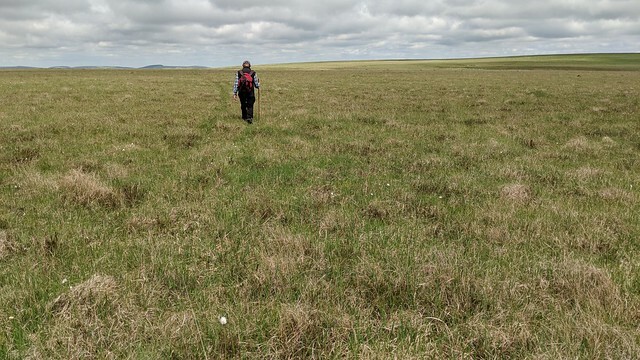 The ground was relatively dry but the abundance of cotton grass was a valuable reminder not to take the conditions underfoot for granted. 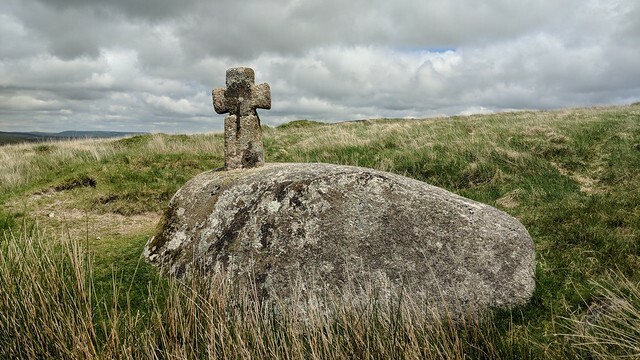 Across the top of the hill, we descended in a rough southerly direction to better ground where we could reach the Abbot's Way and Broad Rock. The rock, is at Grid Ref: SX 6185 6725. 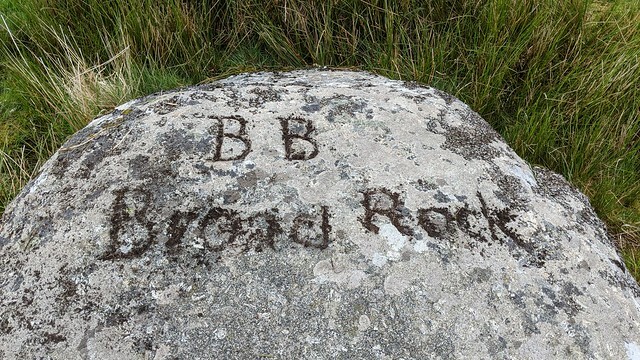 It is engraved "BB Broad Rock", marking Blatchford Bounds; the boundary of Blatchford Manor. The engraving is very worn and the letters are increasingly more difficult to read, so Tim employs a trick he had learnt, by using some mud. 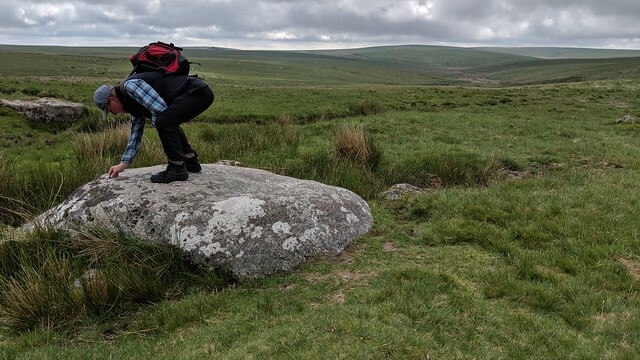 Not far, to the east of Broad Rock, there is another engraved boulder, known as the Arme Head Stone. This is situated at Erme Head once known as Arme Head hence the letter A engraved on the stone. 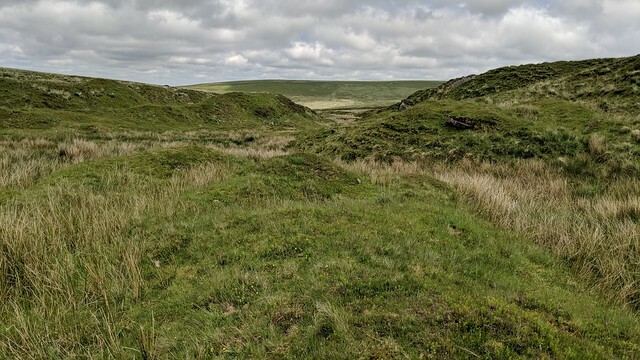 It was once known as Grymsgrove, which is a boundary point of the Forest of Dartmoor. Without a grid reference of SX 6206 6727 it would be difficult to find this stone. Ordnance Survey maps put Erme Head five hundred metres further south, which is one reason I have never found it before! 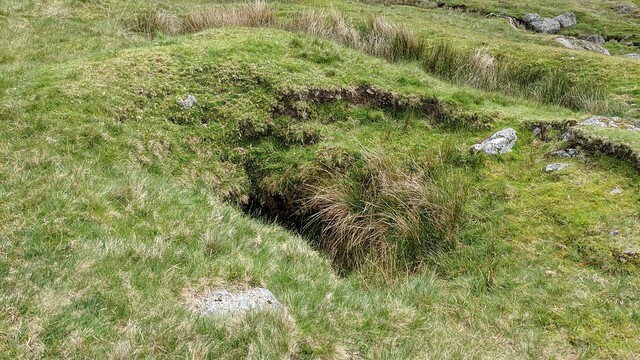 For Tim to have visited it many years ago, in clag, was extremely fortuitous! We drop into Erme Pits. A huge tinner works that must have been one hell of a site to behold in its day. Now, the ravages of industry have dimmed somewhat and it is a tranquil spot. 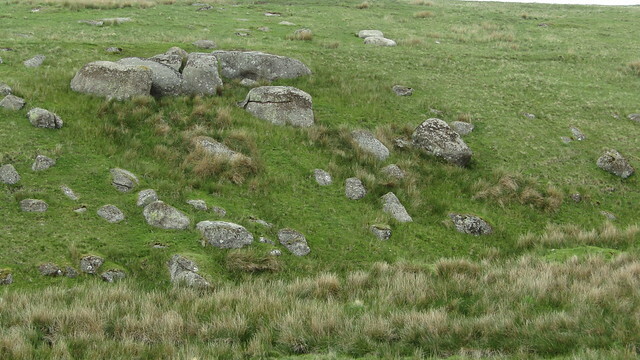 The girts and spoil heaps are now reclaimed by nature, and pleasant to explore on a fine day. We left the infant river and turned up a beautiful girt cut into what the OS map says is Erme Pit Hill, but William Crossing says is an error and is called Wollake Hill; a shame that the mistake is replicated with every edition. The girt is accentuated with splendid mini outcrops dotted along its bright green walls. Marvellous! Arriving at the top, we were among tinners walls, and a long exposed pile of granite stretching down towards the river. We contoured low around the hill to Wollake, also known as Blacklane Brook. 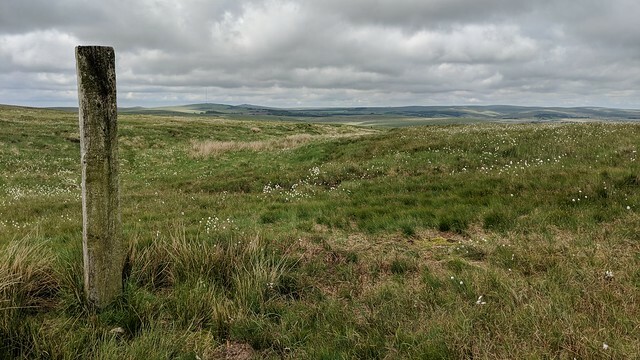 Our next attraction to find was "Grant's Pot" at Grid Ref: SX 6297 6707. I was expecting a pile of rocks with a small fissure but Tim led me to a grassy bank with a dark hole partly concealed by encroaching grass. The cavern is wet and muddy, and I didn't venture in to see if there was still a letterbox located there, so I just crouched in the entrance, sticking my head in to take a photo with flash. I'm glad I didn't crawl inside! 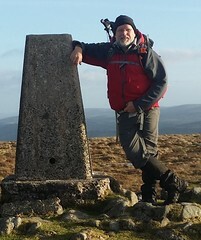 We crossed the Wollake to seek out an outcrop named, by Steve Jenkins, as Wollake Tor. From all previous vantage points it looked a disappointment, but upon reaching it, we were very pleasantly surprised. 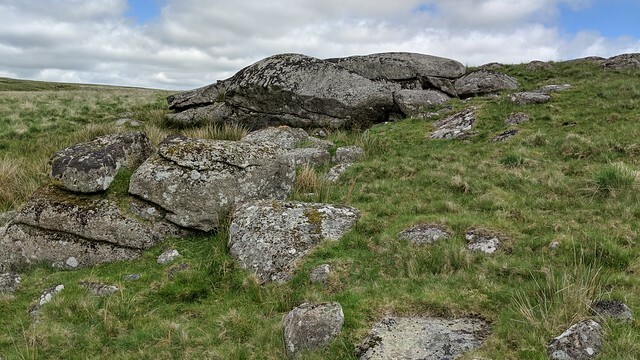 At Grid Ref: SX 6323 6701, its short stature means it does suffer as a spectacle from afar, but it is a nice collection of exposed cracked granite slabs. 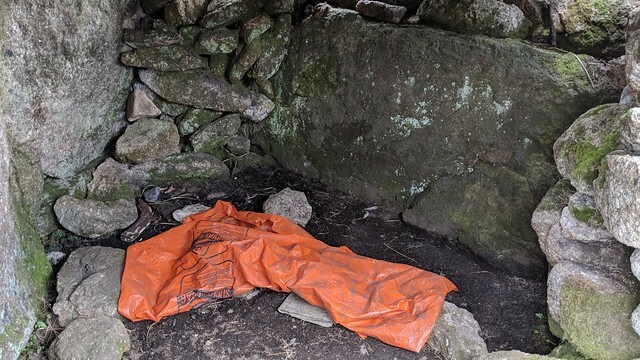 Beneath one of the slabs there is low cave that could fit a bivvy if that's your idea of fun. Before returning to our intended route and the main objective of our walk today, we went south-east over Dry Lake to seek out a possible outcrop that Max Piper had seen on Google Satellite. The diversion was only worthwhile in that it has saved Max from having to check it out; all we found was evidence of more tin workings. We returned to Wollake and turned our attention to Black Rocks. 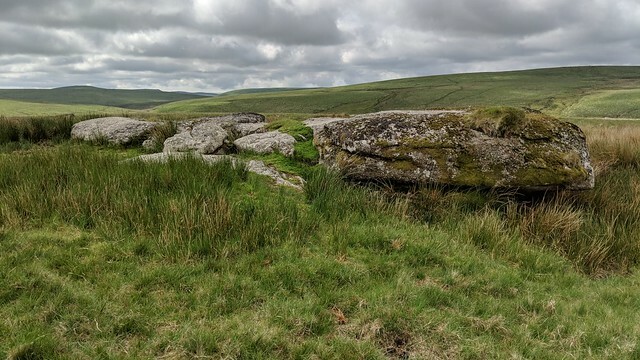 Hemery, in High Dartmoor, describes the location of Black Rocks; "Further downstream, on the west side of the valley and almost on its floor, is the unremarkable, humble tor known as Black Rocks (approx. 1,370 feet).. 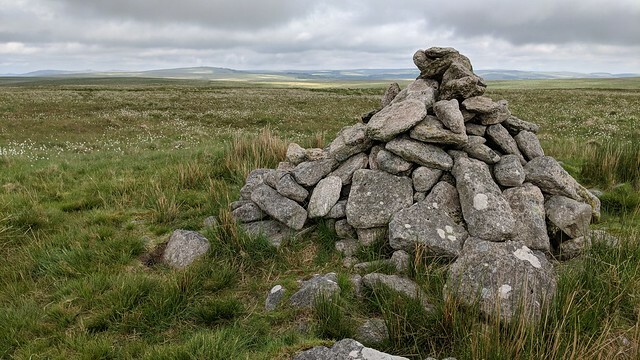 The rocks, although in themselves large, form only a tiny tor - and the only one in this lonely valley.."
The first issue with this is how can Hemery say that this tor, pictured above, at Grid Ref: SX 6298 6716, is the only one in the valley? When you stand here, looking north-east, across the Wollake, you can't fail to notice, barring a heavy mist, a larger, and grander outcrop about a hundred metres away. 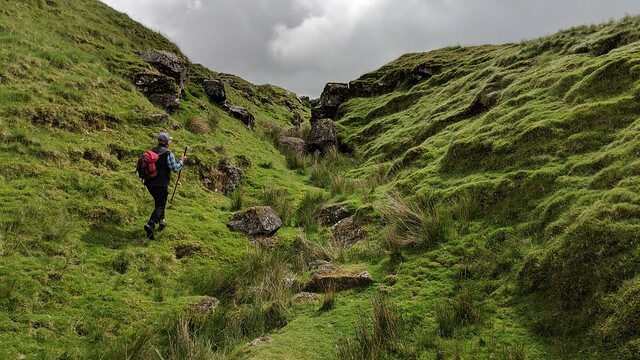 Hemery hadn't been walking in a mist that day, though, because he did mention the tor on the east bank, not as an outcrop, but as the site of a cave; "Marshy banks enclose Wollake as it flows onward, until the valley narrows and conspicuous rocks appear above both banks. 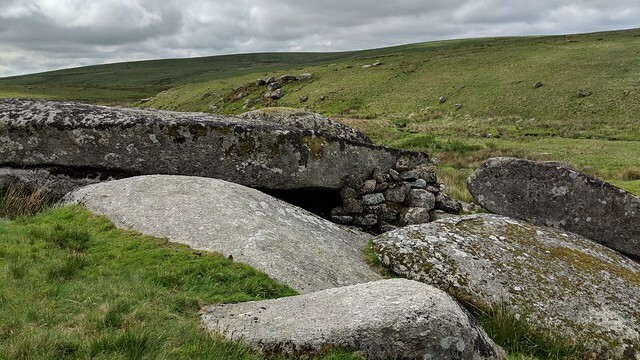 Those on the eastern side of the valley provide a surprise in the shape of a cavern capacious enough to shelter three people.... 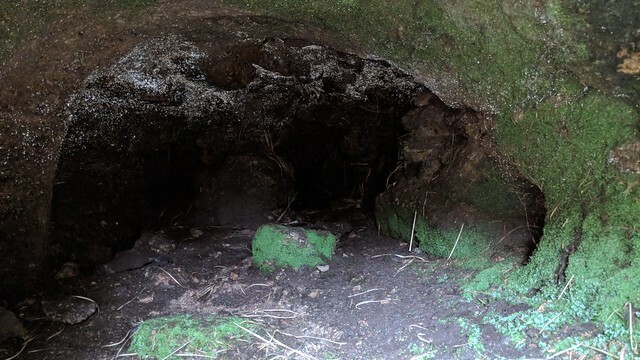 The cavern is known as Phillpott's Cave.". 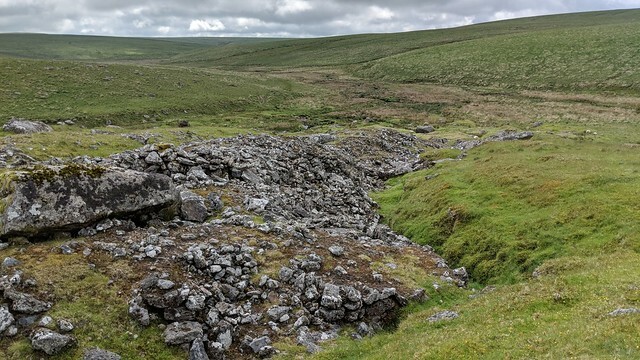 Phillpott's Cave, at Grid Ref: SX 6304 6729, is impressive, but where did the name come from? 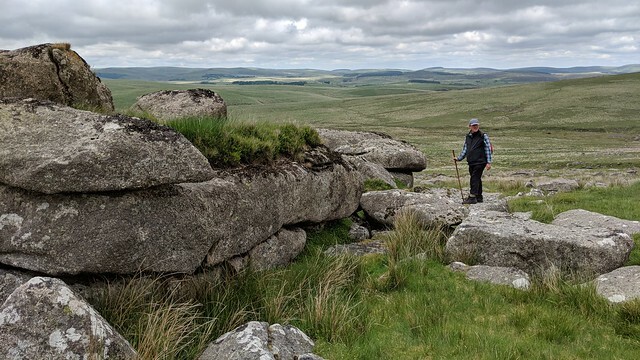 Eric Hemery in "High Dartmoor. 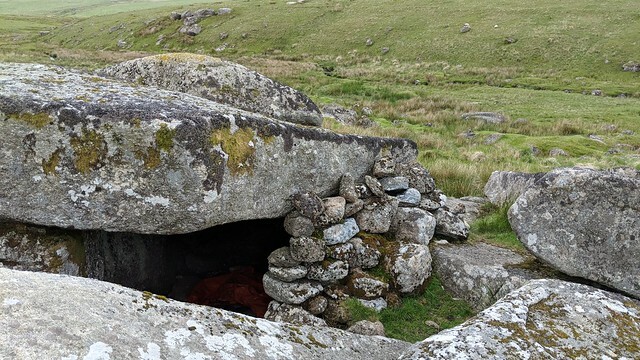 p.175" suggests it is attributed to the author Eden Phillpotts; "The cave was 'adopted' by Eden Phillpotts, before World War I, to be sparsely equipped as a shelter for moormen and others familiar with it. 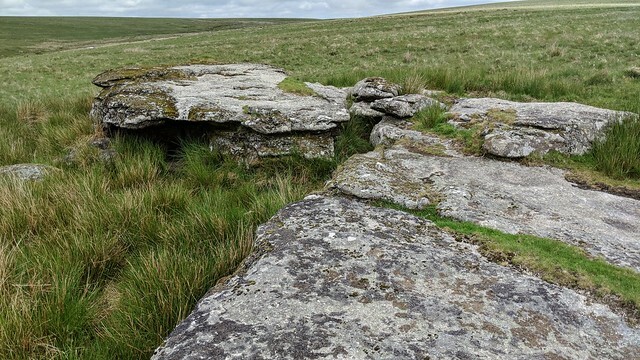 It was cleaned out; gaps in the natural walling were filled with turf, and a cache of preserved food and whiskey was installed in its innermost recess.."
Another theory, is given by John Earle, in his book "Walking on Dartmoor p.130"; "Tony Phillpotts, a hunt servant, used the cave to hide food and drink to be distributed when the local hunt met in this area." "Below the site of the streaming operations the Wollake enters a glen, on the eastern side of which are some masses of granite called Black Rocks, and having traced its course partly through this, we shall find on the R. bank the remains of what there is documentary evidence to show was once a tin mill.."
That description is quite clear; Black Rocks is on the eastern side of the Wollake. He makes no reference to the rocks to the right. Tim and I deduce that Hemery was incorrect. By the time he walked the route the name of Phillpotts was known and the crucial thing is that he seems to have overlooked Crossing's assertion that Black Rocks are on the east bank not the west, where he puts them. 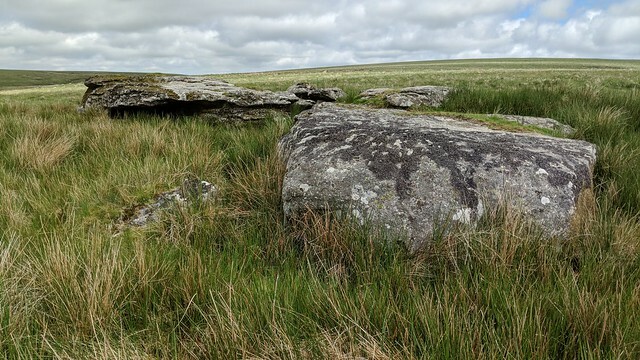 We think Hemery has been thrown by the Phillpotts Cave reference and his mistake has unwittingly been replicated by others, including Mike Brown in "The Gazetteer of Dartmoor Names". Satisfied we had cleared up the mystery, we moved on to visit Ducks Pool and the William Crossing Memorial. We took a route north, to cross the brook near the wooden post south of Black Lane Mire. Crossing the brook here proved impossible, so we retraced our steps a couple of hundred metres and the cut across the tin workings at a fork in the Wollake. 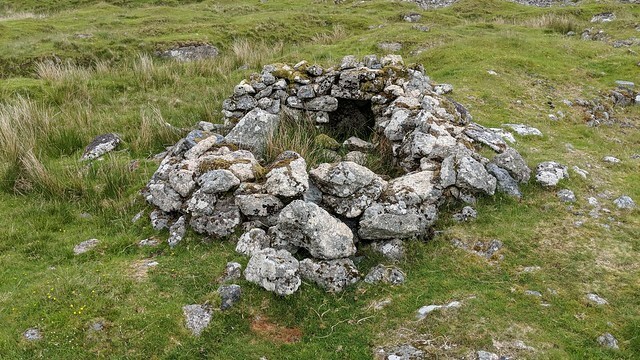 We looked for the remains of the Blowing House, marked on the map, but struggled to see anything amongst the extensive spoils, so moved on to the ruins of Ducks Pool House, a tiny tinners hut. The William Crossing Memorial plaque at Duck's Pool was eventually reached. 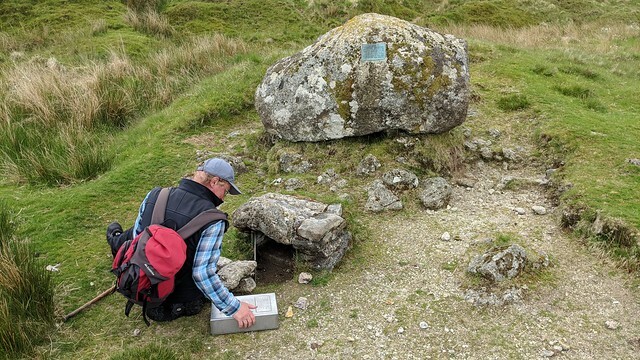 Tim inspected the letterbox; a fine example with the visitors book, stamps and a couple of plastic ducks safely stored in a sturdy tin box and not one of those ghastly plastic "Lock and Lock" affairs that litter the moor. 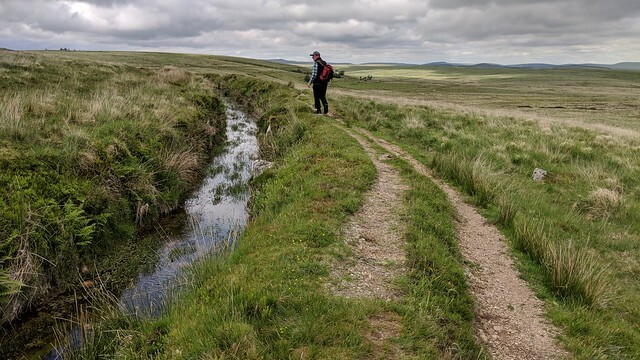 Heading straight for Black Lane, across the mire of the same name, wasn't an option, so we skirted Ducks' Pool and set off across the edge of Crane Hill for over a kilometre, a route akin to bouncing across a soggy mattress. It felt good to get Crane Hill over with. 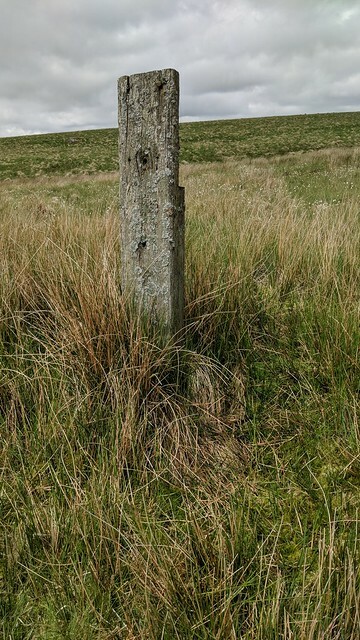 At the head of Black Lane, we reached a railway sleeper post, known as Cater's Beam despite that name actually being the hill to the east. 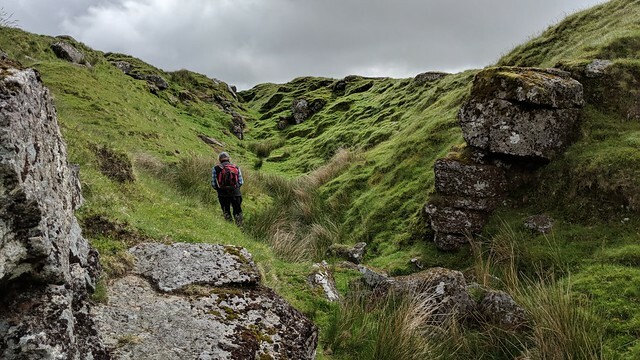 The name "Black Lane" would have you think you have reached a comfortable track, but it is far from that, and can hardly be distinguished from Fox Tor Girt that it takes you to. The girt is a mire and we took some time crossing it. 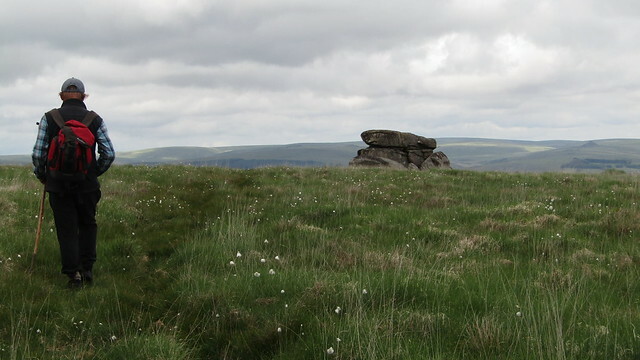 Out of the workings, we spotted Fox Tor, heading straight for it. 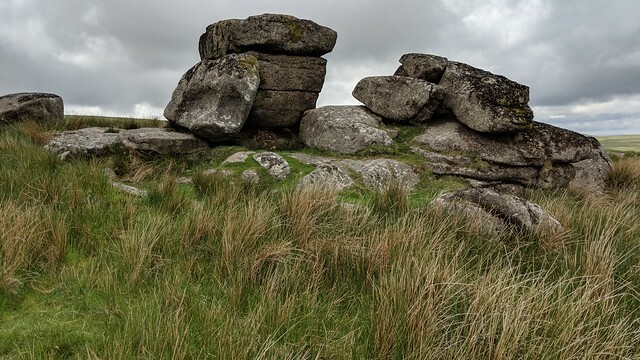 This is a wonderful tor, with interesting outcrops, one known as "The Mammoth Skull"; a toppled piece of granite with two rock basins resembling eyes. 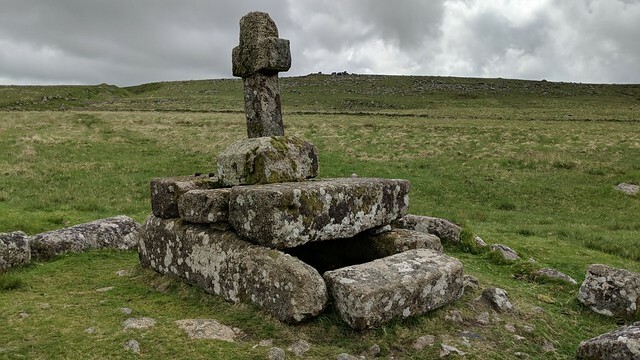 Moving on, a side trip to Childe's Tomb, situated down in the flat expanse below, on the edge of Foxtor Mires, at Grid Ref: SX 6257 7029. Back up to the wall, we passed through and followed it west. About eight hundred metres further, we passed through a gate to visit Goldsmith's Cross at Grid Ref: SX 6165 7015. Named after Lieutentant Malcolm Goldsmith, who discovered it in 1903. Tim had sensibly spied a route around Foxtor Mires, as opposed to my original plan to go straight across. 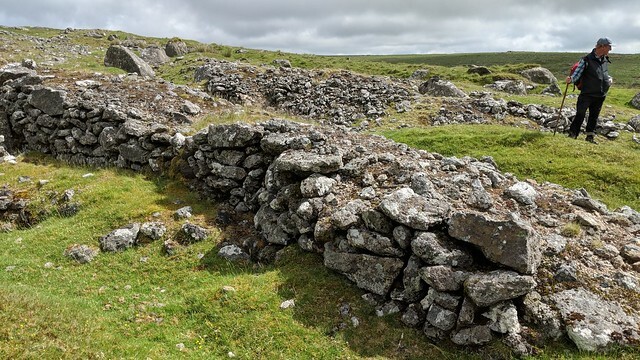 We made our way up through long grass to a worn route beside another wall and followed it up to the Devonport Leat. 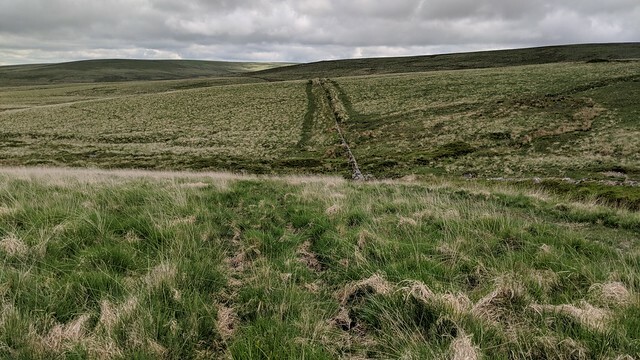 The reassuring track beside the leat was comfortable, but to follow it would have taken us out of our way and so we crossed at a narrow iron girder footbridge, pushing on across more long grass to the sanctuary of the road for our final couple of hundred metres to the car. A cracking day, topped off with a pint of Otter in the Warren House Inn!